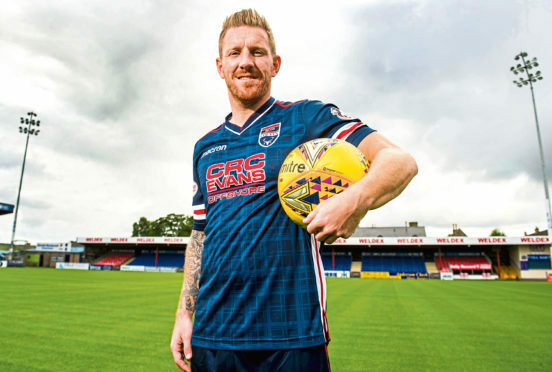 Ross County co-manager Steven Ferguson is ready to unleash midfielder Michael Gardyne on Dunfermline tomorrow following his return from suspension. Gardyne missed last weekend’s 1-0 opening day Championship victory over Alloa Athletic due to a one-game ban, which was incurred towards the end of last season prior to County’s relegation from the Premiership. The former Celtic and Dundee United player is a firm favourite with Staggies supporters, and holds both the club’s appearance and goalscoring records across four separate spells with the Dingwall club. Ferguson says the 32-year-old is showing no signs of winding down, and he said: “Stuart and I both feel Michael has come back in fantastic condition and with a real spring in his step. His performances so far have reflected that. “We probably missed a little bit of his directness last Saturday but we now have that option again. “We have good options. We recognise the value of Michael coming back in but also the job people did when he was out. It does give us a decision to make. “Michael has been an important player for the club over the years and, on his day, he is very difficult for the opposition to deal with. “It is a credit to him he has come back for the start of the season in as good a condition as I think I’ve seen him in 10 years. County were forced to dig deep for their late victory over a stuffy Alloa side that are newly-promoted to the second-tier. Tomorrow’s opponents are also high in confidence, with the Fife outfit securing a 3-2 victory over Dundee United on the opening day, and Ferguson is wary of a different type of test against the Pars. He added: “People are going to have to get used to the nature of the Championship this year. It is going to be tough with all types of games – cagey games and free, open games. “Everybody is capable of beating everybody else on their day. It is certainly set up for a competitive season. “It has happened before in the Championship that only a few points separate teams near the top with teams near the bottom. “Every team has enough in the locker to produce on the day.